Buy or rent. 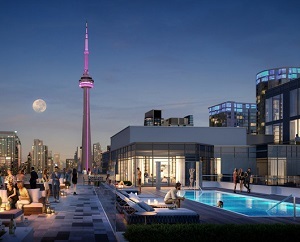 Residents of a new enclave being constructed by Minto Capital Management Inc. in Toronto’s Downtown West District will have both options following the developer’s recent announcement of its new 39 Niagara tower. “At a time when demand for rentals is at an all-time high, we’re pleased to offer a new housing option in the city,” said Minto Capital Asset Management vice-president Paul Baron of the decision to go the rental route as opposed to building another condominium like its neighbouring Minto Westside at 27 Bathurst St. The apartment building located near the northeast corner of Bathurst and Front Streets at 39 Niagara St. consists of 501 rental units, 54,700 square feet of retail space and more than 25,000 square feet of indoor and outdoor amenities. Sizes will range from bachelor units to three-bedroom suites which will rent for what Baron called competitive market rates. Since Minto is privately held, he wouldn’t reveal any financial details about the development, but said it’s expected to drive solid returns for investors. As with many such developments, Minto is also accommodating ground-floor retail space to serve the buildings and surrounding neighbourhood. The amenities at 39 Niagara will include: a full-service fitness centre with yoga room, sauna and steam room; media, games and party rooms; an outdoor rooftop swimming pool; a rooftop patio and urban garden; barbecues and fire pits; pet facilities, including an unleashed dog area; and 24-hour concierge service. Minto Westside, which is 99 per cent sold, includes 690 condo units in 18- and 20-storey towers connected by a nine-storey podium. Its amenities will include: an outdoor swimming pool; indoor and outdoor lounges; bars; the Movement Haus gym; and an outdoor fireplace. Occupancy is expected next February for the condo tower and in July 2019 for the rental units. Minto announced last month it was releasing 1235 Marlborough, a purpose-built rental building in Oakville that’s close to public transit, Oakville Place mall, schools and hospitals. The 14-storey building, comprised of 144 units, is in the College Park neighbourhood at Trafalgar and Upper Middle Roads. The pet-friendly building will feature mostly two- and three-bedroom units. Its amenities will include: a fitness room with yoga space; an indoor common area lobby equipped with USB ports throughout; an outdoor common area; quiet study rooms; bicycle racks; underground parking; and an on-site resident services office. Pre-leasing is underway and residents are expected to move in beginning in August. “We’re continually evaluating opportunities and market demand with a focus on growth for Minto,” said Baron when asked what other developments are in the pipeline. Minto Capital Management Inc. is the investment management division of The Minto Group, a fully integrated real estate enterprise established in 1955 with expertise in asset management, property management, development and construction. The company has 1,200 employees across Canada and Florida. It has built more than 85,000 new homes and manages 13,000 multi-residential units and 2.7 million square feet of commercial space.